These tests have been conducted in a not accelerated reference system. A roll angle of roughly 60° was a hard contact. This caused very high accelerations. These high accelerations will never occur during the flight of a UAV. They may occur in the case of a crash. 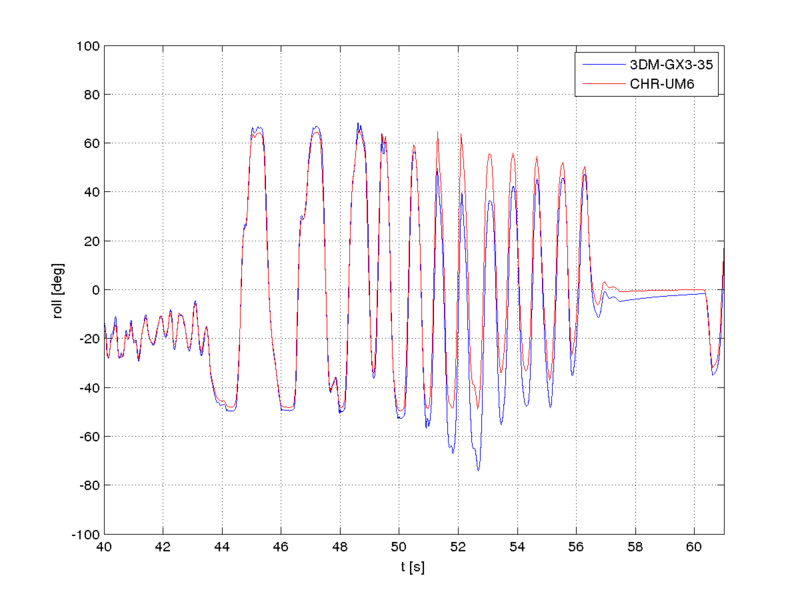 It seems that the 3DM-GX3-35 has some problems with those very high accelerations. As shown in Fig. 3 around t = 58s the CHR-UM6 goes instantly back to its initial position. The 3DM-GX3-35 goes very slowly back to the initial and real position. Without the high accelerations, both roll angles fit very well together (Fig. 4). Fig. 3. Comparison with high acceleration peaks. Fig. 4. 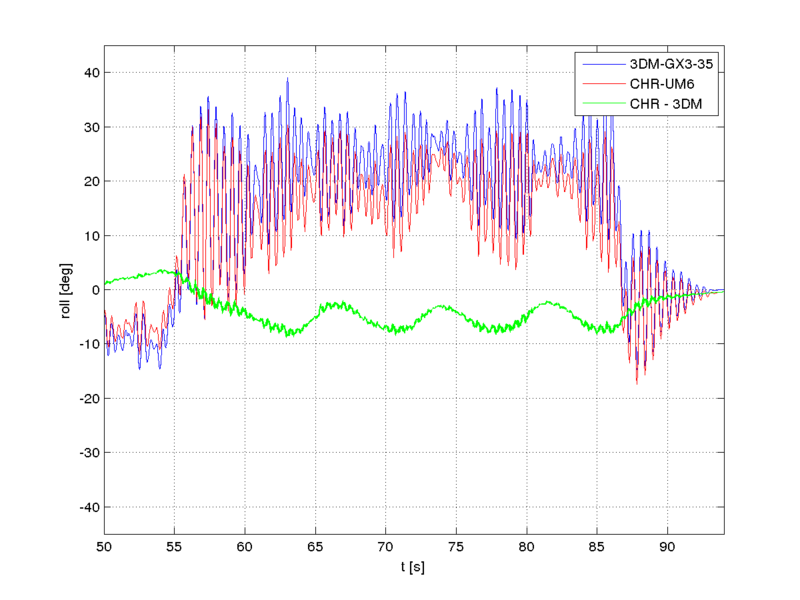 Comparison of CHR-UM6 and 3DM-GX3-35. These tests have been conducted in an accelerated reference system. A car was used to drive around in circles and induce additional accelerations. 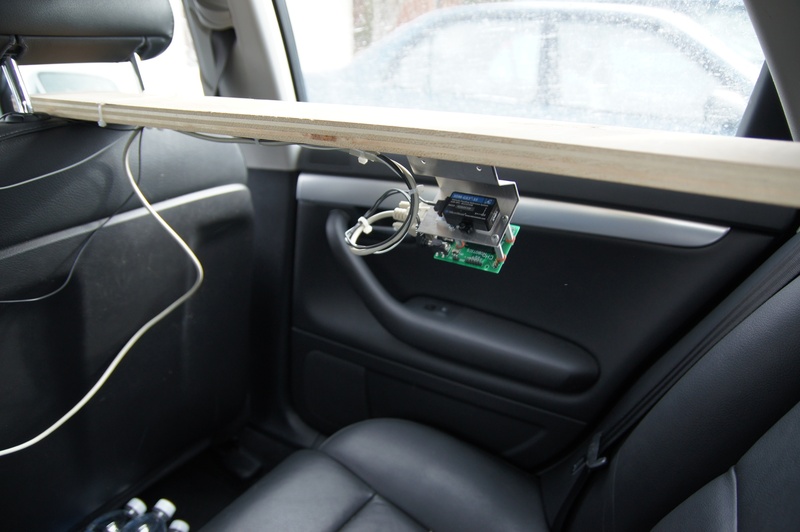 The circle together with the pendulum in the car (Fig. 5) simulates a coordinated steady circle flight of a fixed wing aircraft. This is also comparable of the accelerating phase of a multi rotor vehicle. Fig. 5. Pendulum during driving a circle. Due to the the short pendulum and the low damping there is a strong oscillation Fig. 6. Between t = 55s and t = 87s was a steady circle conducted with roughly Φ = 20°. This is equal of an additional side acceleration a = 3.4m/s² (1). As in Fig. 6 shown, a steady difference of roughly -5° between the two is obtained relatively fast. Fig. 6. 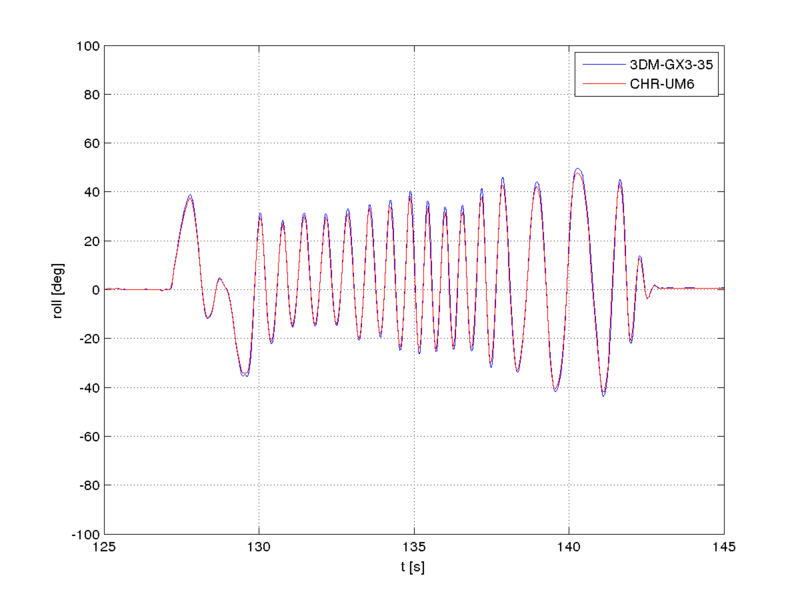 Result with short pendulum and low damping. Fig.7 shows a test with a longer and better damped pendulum. This test shows circles in two different directions. The CHR-UM6 drifts a few degrees off and after roughly two seconds it is constant. This drifting occurred do to the correction with the acceleration. Without additional fusion CHR-UM6 would go to 0°. Fig. 7. Result with long pendelum and higher damping. Sometimes a phenomena occurs which is shown in Fig. 8. An exact cause of that phenomena could not be determined. Fig. 8. It seems the there is some jitter problem. 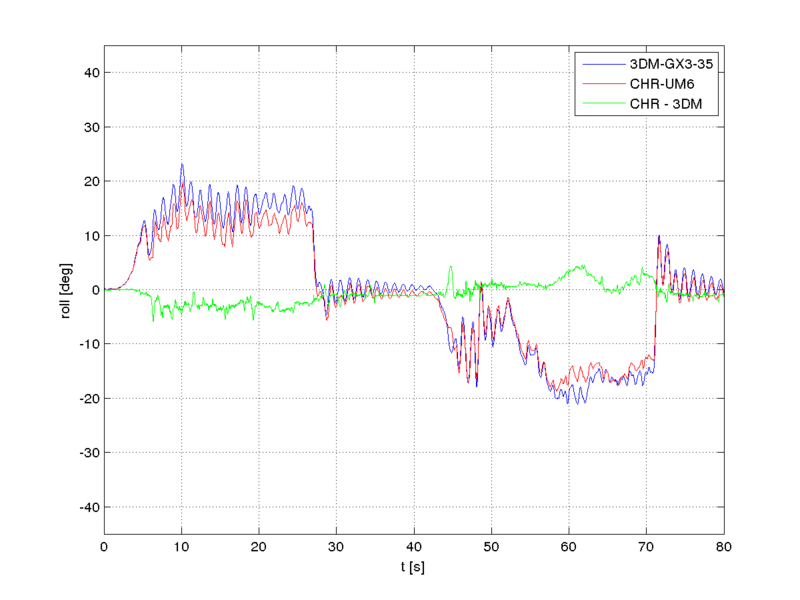 Compared to 3DM-GX3-35 the CHR-UM6 performs very well, considering the price difference. 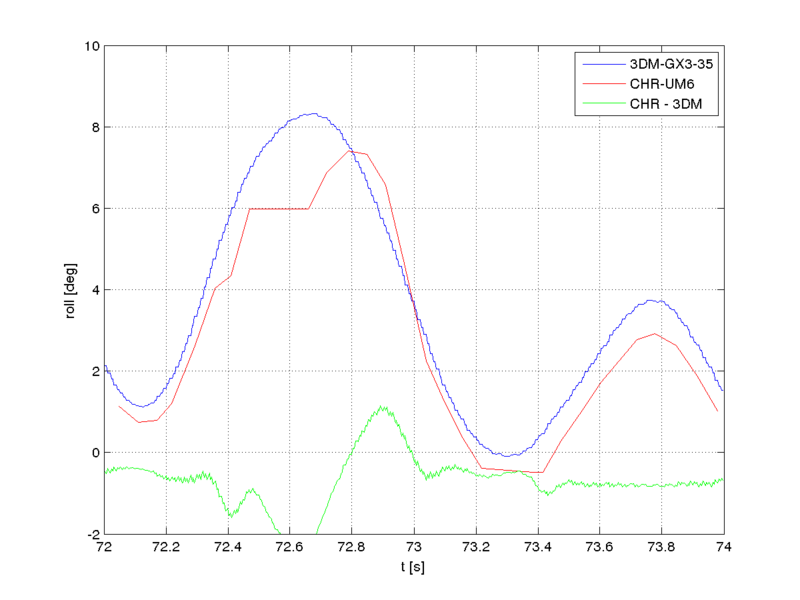 During steady additional accelerations, CHR-UM6 drifts a few degrees off, but the drifting stops so that there is a kind of constant offset of a few degrees. The before described jitter problem would need a further investigation. By arminstrobel in Uncategorized on 30. September 2013 .